When George McClintock retired from the Union Pacific Railroad in 1960, he took a part-time job at Santa’s Village Theme Park in Sky Forest, California as an electrician. A few years later in 1963, McClintock was asked and accepted an offer to become the park’s official Santa Claus. A position he would hold for nearly seventeen years. During his years with Santa’s Village, McClintock worked daily in the park along with appearing in local and regional Christmas parades. 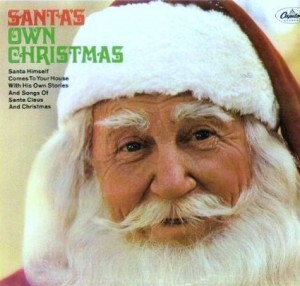 In 1967, he appeared on the cover of a children’s Christmas album featuring folk singer Walt Jacobs. McClintock retired from Santa’s Village in 1979 moved away from the San Bernardino Mountains. McClintock passed away in 1989 at the age of 91. To the multitudes of visitors to Santa’s Village in Sky Forest during the 1960s and 1970s, George McClintock was the Santa of the mountain area known as the “Rim of the World”.